When the third in a series of trials over the 2014 Bundy Ranch standoff in Nevada gets underway, prosecutors will be able to use testimony from an expert in extremism and domestic terrorism, the judge in the case has ruled. Defense attorneys for one of the accused Bundy supporters, Ryan Payne, of Montana, had sought to keep much of the federal agent’s testimony out of the case, saying his expertise on militias and terrorism would prejudice the jury. Jury selection for the trial—which includes Payne, Cliven Bundy and his sons Ammon and Ryan—begins next week. The men are facing a raft of charges related to the armed confrontation, near Bunkerville, Nevada, which prevented federal agents from confiscating cattle that had been illegally grazing on public land for decades. The trial was postponed following October’s mass shooting in Las Vegas, where the trial will be held. Defense also sought not to prejudice the jury on firearms, underscoring how hard attorneys are working to keep the Bundys separate in the minds of a public from a great deal of gun violence in the years since the standoff. Domestic terrorism did not factor much into two previous trials of Bundy supporters, earlier this year. Prosecutors said explicitly they were not trying to prove the defendants were “domestic terrorists.” But in a response to Payne’s motion, Acting U.S. Attorney Steven Myhre wrote that Seyler’s expertise would provide context and credibility to his investigation of Payne, which had begun in 2013. “The government will present evidence that Payne was looking for an opportunity to have a forcible confrontation with government agents and that Bundy Ranch provided that opportunity,” Myhre said. Navarro made a similar ruling in a related trial earlier this year, though prosecutors stayed away from the topic of terrorism anyway. Todd Leventhal, a defense attorney for Scott Drexler, who was part of that case, told me that in previous trials, government witnesses briefly mentioned the 1995 Oklahoma City bomber Timothy McVeigh and referenced ISIS—both of which the defense objected to. A woman at a “Patriot Party” near Bunkerville, Nevada, in April 2014, after the Bureau of Land Management called off its effort to round up Cliven Bundy’s cattle. But Payne’s recent motion to exclude the topic from testimony points to the defense’s desire to keep broader questions in the national conversation out of the courtroom. The trial is taking place just weeks after the deadliest mass shooting in recent U.S. history. That shooting, along with the 2016 armed takeover of Oregon’s Malheur National Wildlife Refuge, also by Bundys and their supporters, may prove hard to keep out of the minds of prospective jurors. Threats of violence and mass shootings have become a major point of political contention in recent years, including questions about various applications of the Second Amendment. 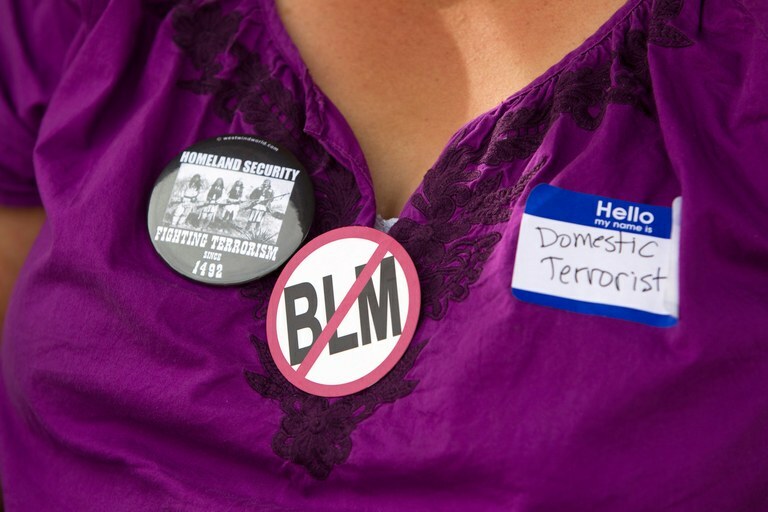 Following the Las Vegas shooting; the death of a counter-protester at a white supremacist rally in Charlottesville, Virginia; and other acts of violence throughout the country in recent years, more and more critics question why the term “domestic terrorism” is not more commonly used, if not in legal circles, at least in media reports. In fact, how authorities describe domestic terrorism is complicated. Nearly every agency that deals with the issue has its own definition. U.S. legal code defines domestic terrorism as an illegal act that is dangerous to human life and motivated by a desire to influence government policy. (“Terrorism” is defined differently, based on the individual’s ties to any of the 60 or so groups, mostly Islamic extremist, that the State Department deems terrorist organizations.) Thus, despite the horror he caused, authorities aren’t using the term to describe the Vegas shooter, Stephen Paddock, who killed 58 people and himself, and injured at least 500 more. Many experts say even when a perpetrator of mass violence is clearly tied to extremist beliefs, authorities are reluctant to define his actions as terrorism. For example, the term wasn't initially used to describe Joseph Stack, who flew a small plane into an Internal Revenue Service building in Texas in 2010 and left a long note about his hatred for the federal government. Dylann Roof, the white supremacist who killed nine black churchgoers in South Carolina in 2015, didn’t get the moniker either. These men were white—as are the defendants in the upcoming Bundy trial. Critics of the Bundys say this shows the defendants may be getting a break that is a part of America’s cultural fabric. Muslim Americans are often more readily deemed terrorists than other Americans, says Daryl Johnson, a law enforcement consultant and former counterterrorism expert at the Department of Homeland Security: “A different standard is being applied to Muslims than to other people,” he told Reuters. A recent Reuters study found that in 100 federal cases, people accused of acting on behalf of Islamic State faced stronger charges than suspects of domestic terrorism. And yet the majority of terror incidents in the U.S. are perpetrated by right-wing extremists, according to nine years of data collected by the Investigative Fund at the Nation Institute.